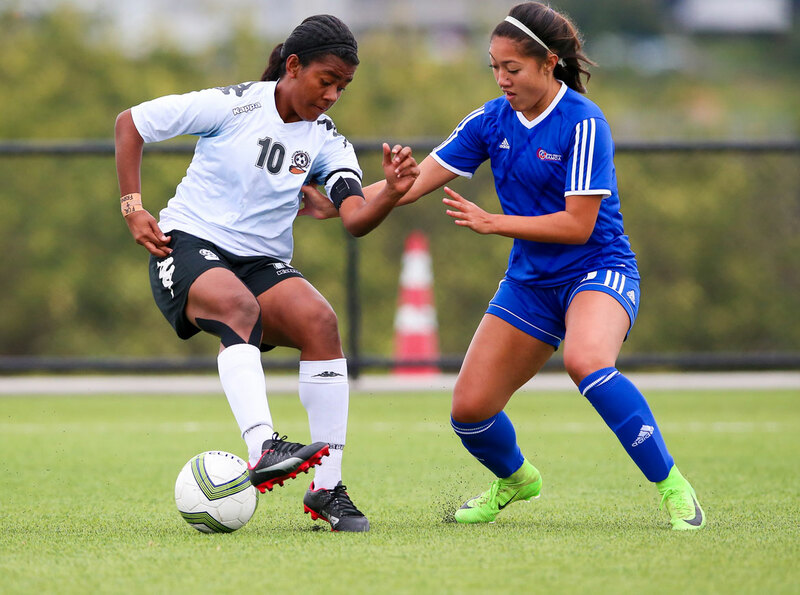 A cloud of sadness hung over each of the games on Match Day 3 of the OFC U-19 Women’s Championship as news of the passing of Fiji youth international Francine Lockington filtered through the team camps. However with a job to do, all six teams set about continuing their campaigns as best they could with Papua New Guinea coming from behind to secure a 4-1 win over Tonga before New Zealand ran to a 12-0 victory against New Caledonia. Fiji struck first but allowed Samoa back into the match and the two teams ultimately proved inseparable thanks to a late equaliser from Fiji locking them up at 2-2. It was a tough outing for the Fijian girls who were still visibly shaken by the loss of their teammate and Fiji coach Saroj Kumar dedicated his side’s valiant performance to Lockington, who passed away on Saturday. “Today they were playing for Francine,” he said. “Francine was our number one goalkeeper and when they came here to the ground on the bus, normally our team comes in singing but today they came in crying for Francine. The game was dedicated to Francine. All the games that we play from today are for Francine. “At first we were down because of what has happened. The girls were crying when they went inside the changing room at half-time. We tried to psych them up and boost up their morale,” he continued. The match looked like it was Fiji’s to win for the majority, and the side were unlucky not to convert the several opportunities they created in front of the Samoa goal. Samoa goalkeeper Katarina Ah Sui had to be replaced in the first half when she sustained an injury after making an excellent save. Fiji pushed forward early in the second half and earned their lead when Cema Nasau sent a cracker over substitute goalkeeper Jecky Toma’s hands. Samoa fired back fast and had earned the lead less than 10 minutes later after Hunter Malaki nailed in a free kick and Shalom Fiso followed with a powerful shot in the top corner. Both teams threw everything into the final minutes of the match, with Fiji’s determined defending seeing them down to 10 players after goal scorer Mereoni Tora received a second yellow. However their high pressing paid off when Fiji were awarded a free kick just outside the box in the first minute of injury time. Captain Luisa Tamanitoakula took a stab at goal herself and the risky move proved successful as she placed the ball just out of the keeper’s reach in the top corner for the equaliser. Samoa coach Martin Tamasese said defence was an area they were working on, so to concede two goals wasn’t exactly how he saw the match going. “We’ve been working hard on our defence, and we had chances to finish so hard luck for us,” he said. In the day’s opening match Papua New Guinea continued their impressive form against Tonga, dominating possession and putting plenty of pressure on their opponents. Tonga pushed forward from the outset and it paid off when they earned the lead just six minutes after a quick counter attack saw Mele Kafa break through the Papua New Guinea backline and smash the ball into the back of the net. Papua New Guinea upped the pressure after conceding, creating several opportunities up front. The Tonga backline managed to hold them out until the 26th minute when a perfect through ball from Ramona Padio set up Selina Unamba in front of goal. Padio found the net herself in the last minutes of the half, sending the ball past Mele Akolo after the keeper dived to punch away Padio’s first attempt at goal. Six minutes after returning to the field for the second half Padio found herself with a brace as she once again followied up a clearance from Akolo. Nicollete Ageva was behind the final goal for Papua New Guinea, positioning herself perfectly to receive a ball from Padio who had weaved through the midfield and defence to meet Akolo in a one-on-one. Padio tapped the ball right to an unmarked Ageva, who calmly slotted the ball into goal. Down the other end of the field, Tonga’s Seini Lutu was unlucky not to score after having several attempts blocked by some acrobatic saves from goalkeeper Faith Kasiray. Lutu’s closest attempt was from a free kick just outside the Papua New Guinea box, which she sent over the wall towards the top corner. Kasiray jumped for the ball, just reaching a fist to send it over the crossbar. Pleased with her side’s strong win, Papua New Guinea coach Rachel Wadunah credited their opponents for putting up a strong challenge. “Tonga’s performance was good. They held the ball, they passed the ball and they combined well to finish off that goal. It was a fantastic goal,” she said. Yet to win a match, Tonga coach Christian Koaneti was disappointed to lose their early lead but acknowledged the talent and determination of their opponents left Tonga little room for errors. “For the first 20 minutes we managed to stick to what we had planned but then towards the end of the game we made far too many mistakes and Papua New Guinea managed to capitalise,” he said. New Caledonia knew they had an immense challenge ahead when they took to the field against defending champions New Zealand today. Although at times they looked like they might hold off the onslaught from New Zealand, the task proved too great as the Kiwis were already seven goals up at half-time. “Today we knew that New Zealand would be significantly better,” New Caledonia coach Kamali Fitialeata said. “But I think today I can at least be proud of the girls and their attitude because it was much improved from last Friday. Nicole Mettam and Samantha Tawharu were first off the mark scoring within a minute of each other, before Deven Jackson took New Zealand to a three goal lead on the stroke of 20 minutes. Emma Main scored twice in quick succession before New Caledonia rallied at the back to go a good 20 minutes without conceding. Jackson had her brace in the 42nd before Tawharu followed suite in the first minute of additional time to give her side a comfortable seven goal lead at the break. Dayna Stevens got New Zealand on the board in the second half placing the ball perfectly in the 50th minute. Main then secured a hat-trick when she headed in a well-directed free kick taken by Michaela Foster. Foster then got one of her own when she took New Zealand to double digits in the 70th minute. Substitute Grace Jale scored a beautiful long-range effort before Tawharu became the second Kiwi to score a hat-trick with her 88th minute strike. New Zealand coach Gareth Turnbull was pleased to once again put a match to bed with a comfortable win. “I’m pleased to walk away with a decent score line in the end. Although we can be proud of the result and being a step closer to qualification, the fact we left a large number of goals out on the field is a concern,” he said. The teams will take a three day break to rest and recover before the OFC U-19 Women’s Championship returns on Friday 21 July.